When I saw this bouncy ball spider necklace in my facebook feed earlier this week, I was reminded I had extra bouncy eyeballs from my eyeball wreath project. I also happened to have a pair of white girl's tights in my craft stash to make a spider sac decoration. I grabbed the tights. I only need one leg for the spider sac. No problem then to cut off a leg for this project too. Drop a bouncy ball eye in the leg and knot on each side. Repeat. Tie ends together and hand over to Princess Fierce. She loves it! I think it would be better done with less opaque tights. 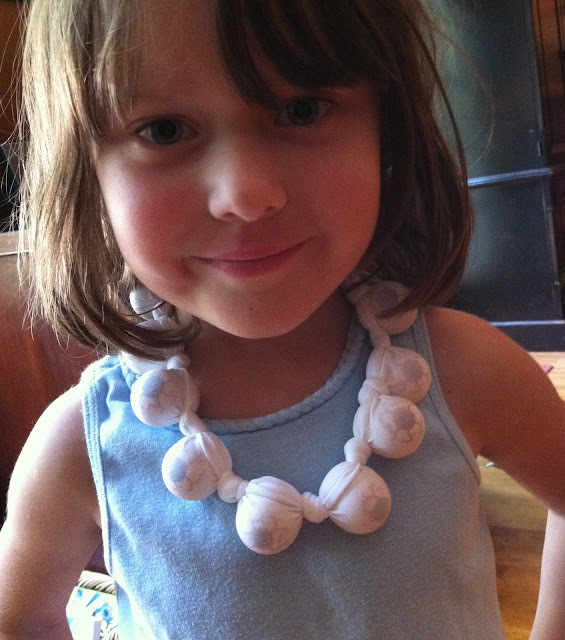 Also I would definitely need to use ladies' hose for an adult necklace; this is just long enough for my little girl. I still have more balls, perhaps the adult version will follow. My two oldest are boys, boys with shirts I love. My youngest is my only girl, a girl with a funky fashion sense. I like to get the most out of all the clothes I buy my kids and low and behold I've discovered how to make some of those boy clothes go all the way down the line to my daughter and in a way her inner fashion diva loves. All it requires is taking the best tees the boys have outgrown, finding a yard or so of coordinating fabric and adding a skirt. The boys' best tees become her spunky play dresses. My oldest in the Dark Side of the Garden shirt two and a half years ago. It all started with this Darth Vader topiary shirt. I found this amazing, super soft Threadless Tee several years ago at a consignment sale for $2. My oldest son loved it. Then it was passed down to my middle son. But one fateful day he decided to see if scissors would cut cotton. His query resulted in a small nick along the bottom hem. I was sad to see this shirt go before its time. So I decided it didn't have to go yet. My daughter liked Star Wars...I could do something with this. I created this soup on a whim. I'd read about a pumpkin soup that used peanut butter last week. Peanut butter? My curiosity was piqued. However, the recipe was in Polish and it involved apples, not something I wanted in my soup. I thought maybe I could make my own pumpkin soup with peanut butter, no apples. So when I was standing in the produce section of my market a few days later, surrounded by fall's bounty, an idea clicked. I would roast the vegetables then add peanut butter! And I didn't want just pumpkin since I'm not a huge fan; I wanted other veggies. Turn art into permanent storage containers! This is something I made September a year ago for my dad's birthday but worth sharing with Christmas right around the corner. 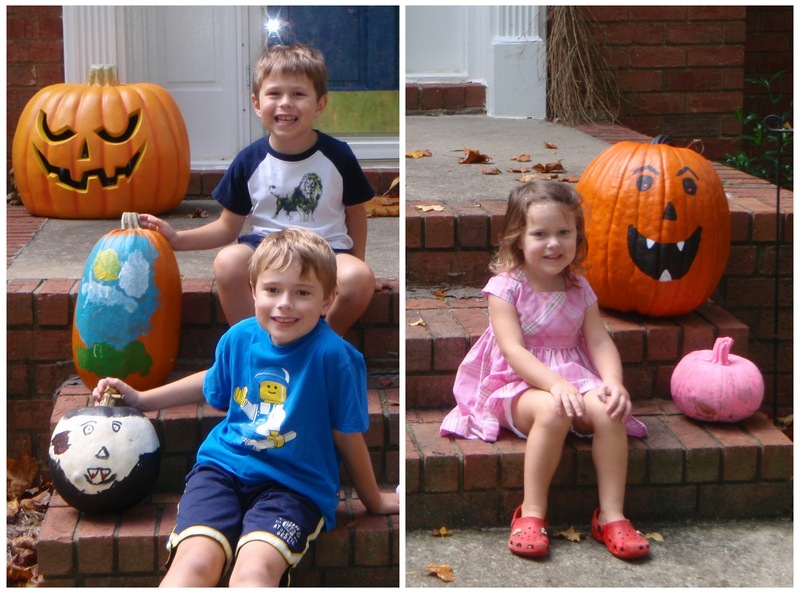 I know, I know, it's not even Halloween but trust me the gift giving holidays will be upon us before we know it. December is like a ninja and just takes me by surprise every year. Fortunately, even if you do get taken by surprise, this present can be done in just a few hours. First you need to find a large glass jar. I bought the large 2.5 gallon jar above at The Container Store. 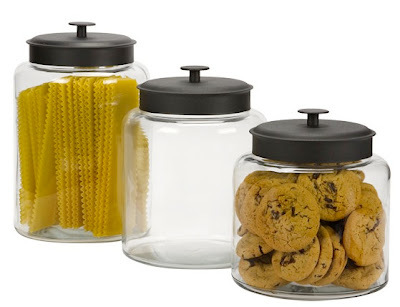 But just this past weekend I saw large glass jars with glass lids at The Goodwill. Yard sales are also great places to find these jars. I've also thought this project would work well for hanging art. Use an old frame with glass or buy a new one to match your decor, add coordinating fabric or scrapbooking paper to the frame's back board to finish the effect. Second you'll need glass paint and conditioner. 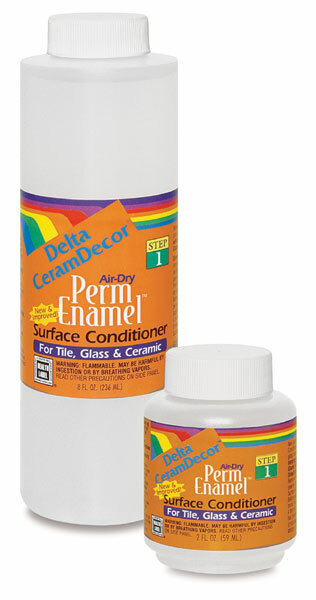 I bought Delta's CeramDecor Perm Enamel. This glass paint air dries and requires no baking. Apply the surface conditioner to your clean glass, allow to dry then you're ready to paint which brings us to the last thing you'll need. Your kid's artwork. This gift was for my dad. He loves pretzels and always kept a huge plastic jug of them on his desk at work. This was to replace that. I asked the kids to draw a picture of their PawPaw. I asked them to only use one color so it would be easier for me to transfer. I cut out their art, used the copier to adjust the size, and taped each drawing to the inside of my glass jar. Finally, I traced over each illustration with the special black glass paint. If your children are older I see no reason they can't do the paint tracing on their own. I couldn't sleep last night so I got busy making the Halloween eyeball wreath I've been imagining. 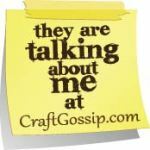 I wasn't sure exactly how I wanted to do it so I gathered a bunch of supplies from my craft stash. The wreath form and black ribbon were a dollar each from the Dollar Tree, the black glitter leaves and flowers are from Michael's and cost a dollar too, the black tulle is leftover from another project and the eyeballs are bouncy balls and a big bag cost only $4 at Target. I wanted to wrap the wreath in black grosgrain ribbon but it turns out I needed two spools to cover the form. So I changed course and wrapped it in the black tulle. We celebrated my middle moppet turning seven this weekend with the feast and cake of his own choosing. 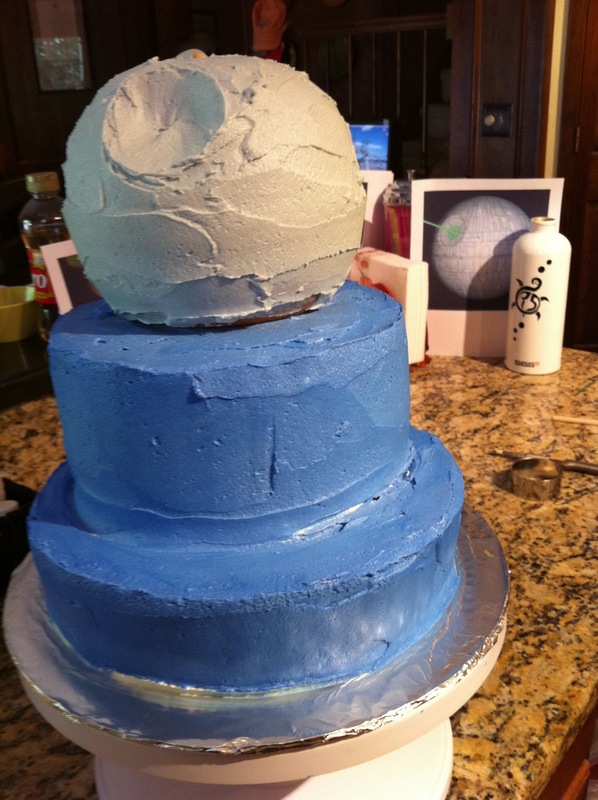 I spent the weekend making it happen creating my first ever stacked cake with a Death Star on top along with a buffet of baby back ribs, collard greens, corn, fried okra, mac and cheese, and lima beans. With a BBQ sauce mustache above his gorgeous grin he hugged me and told me it was a beautiful day. Happy Birthday, little man! 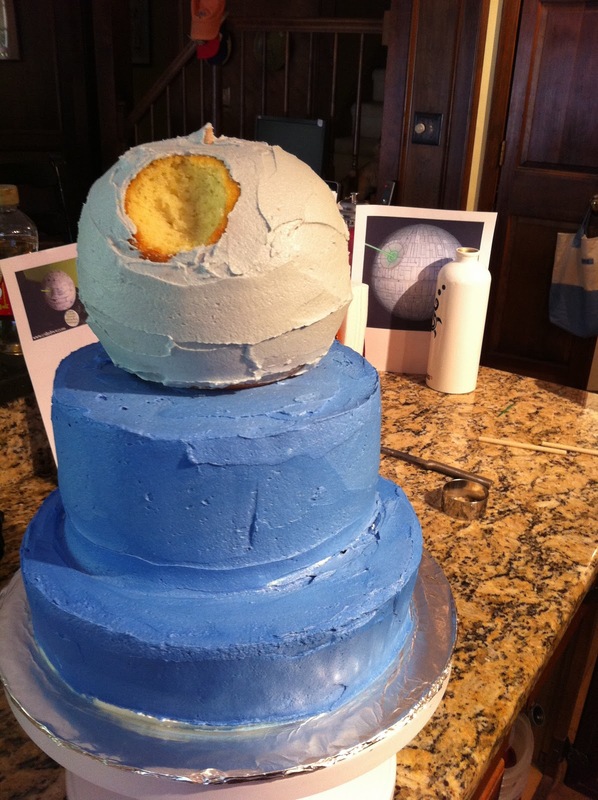 Making the Death Star come to life. In my previous post I mentioned the start of my new found curiosity for making candies and chocolates. It was all a lead up to this entry. I needed a reason to make a solid Darth Vader mask out of black chocolate. And I found it. My friend's fortieth birthday. He's a Star Wars fan; he'd appreciate it. I was very excited. I had plans to make Vader from a mix of milk chocolate and Bailey's Irish Cream. I was melting my large amount of chocolate over a double boiler fashioned from a large bowl when my bowl tipped, steam slipped inside the lip of the bowl, and my chocolate seized. I blogged about that mistake and the resulting yummy truffles here. What I didn't mention in the blog entry was in addition to the truffles, before I froze the chocolate seizure, I scooped out more and pressed the Bailey's-chocolate into my Han Solo in Carbonite candy mold. All his features didn't turn out perfect since the chocolate wasn't pourable and therefore unable to reach the small voids. However, after a toss in cocoa I thought he was decent enough to take pictures of with toys. And eat. I mean, come on, he's made of milk chocolate and Baileys. I think a dip in a hot cup of coffee would be the perfect way to release Han. I was going to post about my chocolate creation this past weekend but thought I should do a first post to explain how this whole candy thing started. 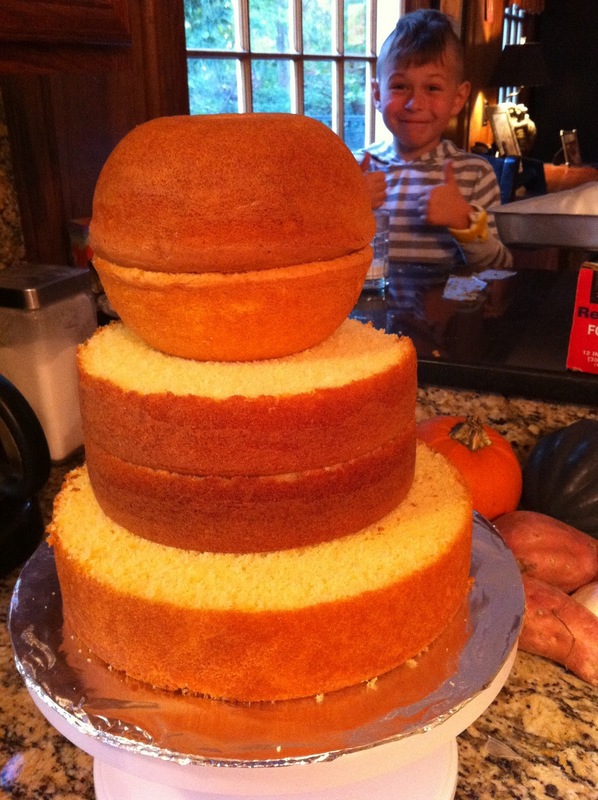 I've been baking and decorating shaped cakes for years for family and friends. Never for money or request. That makes me nervous as a long tail cat in a room full of rocking chairs since I'm self-taught, my only lessons being watching my mom decorate cakes when I was growing up in the eighties. Fast forward to this past February when my super fab next door neighbor asked if I'd bake a cake for her son's fourth birthday party. She said she'd pay. Oh my. I told her I'd do it for just the cost of ingredients and still felt trepidation. The theme was Lego; the design left to me. Originally I thought I'd do a giant Lego brick cake. Have you seen them? Basically a sheet cake with cupcakes on top all iced a solid color. Effective but I thought maybe I could do better. I did have a silicone cake mold of a Lego Man I had purchased at Lego Land. Maybe I could use that. I did a test bake in the mold and realized it would not work with cake. Cute as a brownie. But with added buttercream icing, because I do not, will not do fondant, the details would be lost. Then an idea occurred to me. CANDY! I'd always seen the bag of Wilton Candy Melts on the cake aisle at Michael's. Maybe I could make a candy man from the mold. And I did. And it was easy. And it was awesome! Then I made candy Lego bricks from a Lego ice cube mold. The cake was a big hit. And a candy love was born. I've started experimenting with candy molds and candy making. This weekend is a friend's 40th birthday and I thought he'd appreciate a large chocolate Darth Vader mask. Since I make a tasty Bailey's Irish Cream-Chocolate Mousse, I thought I could make Vader have that same Bailey's flavor. However, the large quantity of chocolate I was trying to melt with the alcohol over a makeshift double boiler did not want to cooperate. My bowl tilted over my pot of boiling water, steam came inside and the chocolate seized. Ugh. I was not happy. 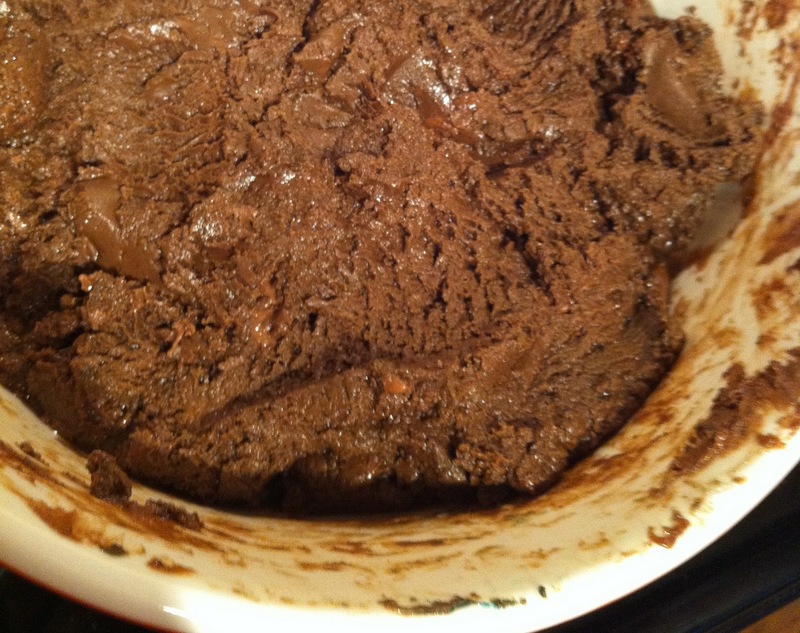 The chocolate looked ugly, and definitely could not be poured into a mold. But it was SO yummy. I rolled up a few balls of the difficult chocolate and let them harden in the freezer. Then I rolled them in a little cocoa to make a Bailey's-Chocolate Truffle. I froze the rest of the chocolate and soon I'll make more small truffles. I'm thinking I need to bake them inside a cupcake like I did the buckeyes last month. Can you imagine them dropped in to the middle of a mocha cupcake with a homemade Bailey's buttercream frosting? *drools* I'll keep you posted when I make those babies, for sure.